As a privileged partner of aviation, Breitling enjoys long-established associations with the greatest professionals and flight teams on the planet – including the prestigious TOPGUN flying school, the US Navy tactics instructor program. 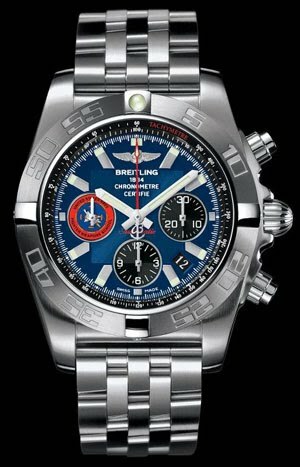 In a meeting held at the NAS Fallon, Nevada base, TOPGUN members unanimously decided to signal their exclusive cooperation with Breitling through the creation of a limited edition bearing their insignia. This Chronomat 44 chronograph, produced in a worldwide 500-piece limited edition and equipped with a 100% Breitling high-performance movement, features a blue dial in the US Navy colors carrying the authentic logo of the “United States Navy Fighter Weapons School” – the official TOPGUN name. The engraved caseback displays the same logo, accompanied by the limited-edition number. Part of the proceeds from the sale of this exceptional instrument will be donated to a charity selected by the TOPGUN cadre.